Obituary for Alan Courtney Debnam Sr. | Beach Funeral & Cremation Services, Inc.
“Jesus said, Come unto me, all ye that labor and are heavy laden, and I will give you rest.” (Matthew 11:28). This is to acknowledge that Alan Courtney Debnam departed this life on Friday, April 5, 2019, in Virginia Beach, Virginia. Born November 6, 1946, in New York City, New York, Alan was the youngest child of Walter R. Debnam Sr. and Sarah F. Debnam. He spent most of his early childhood years in New York City, New York. Alan lived a good life which was full of promise and success. He had a deep interest in automotive and graduated from Brooklyn Automotive High school where he excelled as a student automotive mechanic. He found at that time there was no future in automotive repair and in 1965, joined the Army and was recruited shortly after to the Army Security Agency. He was trained as a Morse Intercept Operator and later was deployed to Vietnam and crossed-trained as a Direction Finder where he was assigned to the 1st Cavalry Division and attached to the Reconnaissance patrol. While in the army he was in Vietnam and had various positions and on July 22, 1969, he was released from active duty and returned to the states. In September of 1969, he was hired as a tester for the New York City phone company. He found he did not like being closed in an office all day so he went back to being an automotive mechanic. He later realized why he left that position before and found other employment as a Technical Representative for the Xerox Corporation. He remained there for 3 months and later became a New York City Transit Policemen. He found that this job afforded diversity and a sense of accomplishment similar that he had always wanted. He loved the fact that he could help people, and was able to work both outside and indoors. While Alan was employed as a Police officer he continued his education and attended the New York Institute of Technology where he majored in behavior science. While there he obtained 103 credits and exhausted his G.I. Bill benefits. By that time his family had grown and was looking for other opportunities to support his family. After reflecting on the past and pondering the future, in March 1977 he decided to join the Air Force Reserves. While in the reserves he attended Loadmaster School. He became a loadmaster with the 732nd MAS at McGuire AFB, New Jersey and started a second career. In September 1987, after 17 years as a transit Police Officer, Alan retired due to all the injuries from making an arrest. 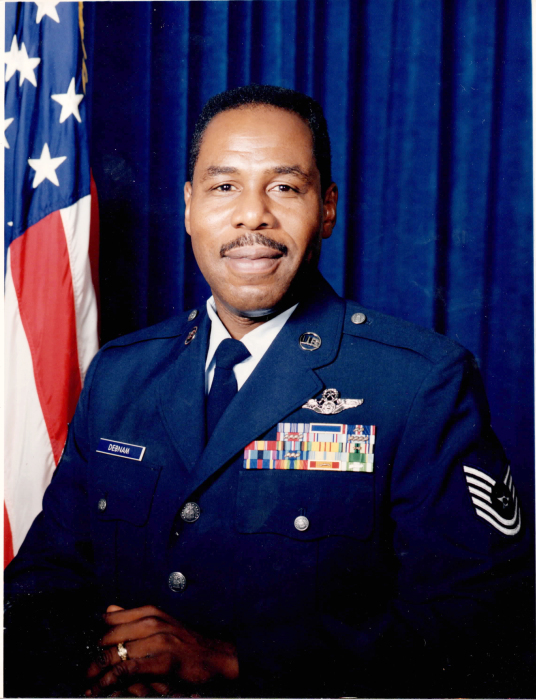 After retiring he decided to move to Virginia Beach Virginia and continued to commute to McGuire AFB where he continued in the Air Force Reserves. While in the Air Force Reserves, he was deployed to both Dessert Storm and Dessert Shield wars. He thought his career as a C-141 Loadmaster was one of his life's greatest fulfillment but later felt it was time to give back, so he moved into a leadership position where he helped influenced young airman and helped them to learn to avoid some of the pitfalls he had experience in his younger years. He later retired at the rank of Master Sergeant USAF. During his career, he garnered numerous awards and medals. Alan served in the Air Force Reserve for 29 years. Alan is preceded in death by his parents, Walter R. Debnam Sr. and Sarah F. Debnam and his 3 older sisters Mary-Helen Jackson (Joseph), Daisy Louise Jackson (Cecil), and Edith Marion Jackson (Robert). Left to cherish his memories are: a significant other, Latonia Moore, his brothers, Charles Phillip Debnam (Annette), Walter R. Debnam (Sarah), his Sisters Cousin/Sister Peggy Brooks-Adams, his children, Donna Debnam-Ellis (Rico), Shayne E. Debnam, Tiffany L. Kinchens, Christopher Charles Cartwright, Alan Debnam Jr. and Ashlie Debnam-Singh, 5 Grandchildren, and a host of aunts, uncles, nephews, nieces, cousins and friends. Please follow us on Facebook at Beach Funeral and Cremation Services, Inc.